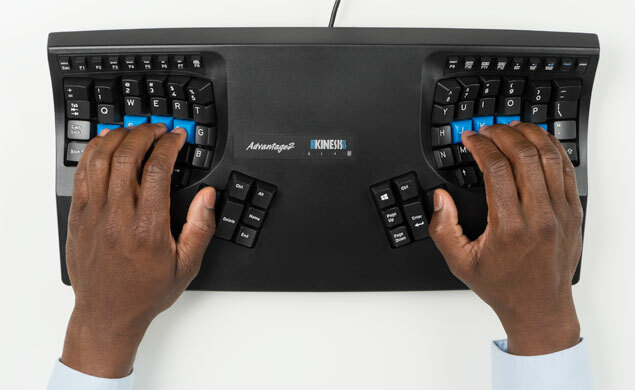 The proven 3-dimensional concave design of this latest version of the Kinesis Contoured Keyboard family delivers unparalleled levels of comfort and productivity for touch typists of all shapes and sizes. The Advantage2 ensures a neutral ergonomic interface for a wide range of touch typists, from 4' 6" to 6' 4". 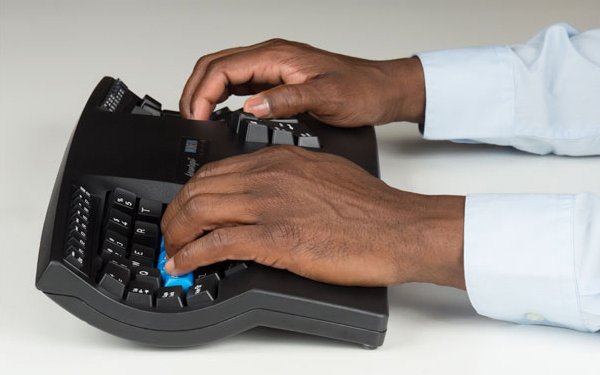 Anyone who considers their keyboard a core tool for their job should consider this keyboard. It is the only keyboard which goes beyond the wrist and addresses the ergonomics at the level of the fingers, intelligently redistributing the repetitive activity associated with typing to minimize the potential of fatigue. This keyboard is especially popular with keyboard intensive users including programmers, transcriptionists, writers and web content developers. This newest revision to the well-known Advantage keyboard has several improvements over the previous model. Cherry ML tactile mechanical keyswitches have replaced the elastomer keyswitches on the function row at the top of the keyboard. 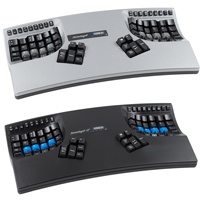 A comprehensive Smart Set Programming Engine allows users to build and save multiple custom keyboard layouts, reducing repetitive or awkward keystrokes and maximizing productivity. Far more and longer macros are now supported, with up to 100 unique macros of 200 characters now available to meet the needs of the most discerning user. It is PC and Mac compatible, and includes additional hard-wired features such as unlimited custom key remapping, macro playback speed, optional audible key clicks and keyboard status reports. 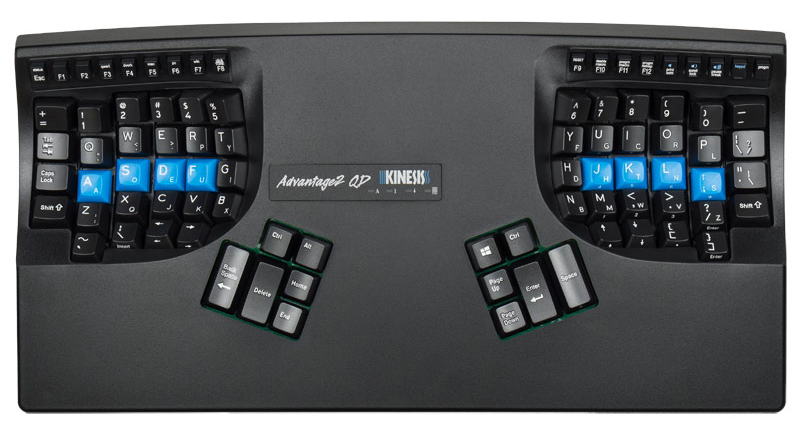 For a complete list of what changed from the Advantage to the Advantage2, please see this overview on the Kinesis web site. The KB600 is the most popular model of the Advantage2, with standard QWERTY key legends and Cherry Brown tactile keyswitches. This keyboard is also available with Cherry Red linear keyswitches (KB600LF), Cherry "Quiet" Red linear keyswitches (KB600LFQ), dual legended QWERTY-DVORAK key legends (KB600QD) and with an eye-catching painted silver gloss finish (KB605). 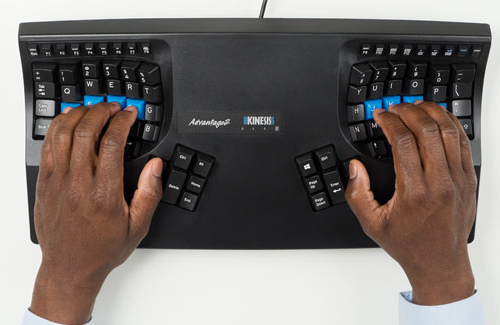 Based on years of research the Kinesis Contoured keyboard was designed not only to reduce the known risk factors associated with repetitive stress injuries but also to provide a more comfortable and productive interface than other keyboards. Its unique contoured design reduces the force and stressful postures that contribute to discomfort and limit productivity. 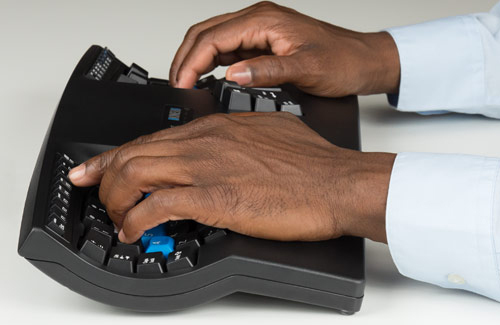 Since its introduction in 1992, this keyboard has undergone extensive independent testing and has proven superior in both comfort and productivity when compared to traditional and other alternative keyboards. Separate Thumb Keypads - The thumb keypad includes high frequency keys, such as "Enter", "Space", "Backspace", "Delete", and modifier keys, such as "Control" and "Alt" on the PC ("Command" and "Option" on the Macintosh). This redistributes the workload from the relatively weaker and overused 4th and 5th fingers to stronger thumbs. Combination keystrokes are effortlessly generated without the requirement to leave the home row with either hand. Separate Keywells for Each Hand - These keywells minimize strain and stretching by positioning the arms approximately at shoulder width and eliminate the need to twist one's wrists while keyboarding. This separated design greatly minimizes elbow abduction as well as ulnar deviation (twisting out) at the wrist through the elimination of the requirement for users to reach in to the midline of their body to the keyboard. It also largely reduces radial deviation (twisting in) at the wrist when reaching for the mouse as the mouse can be located immediately to the left or right of the home row (unlike on traditional keyboards). These non-neutral postures have been shown to lead to repetitive strain injuries such as carpal tunnel syndrome and tendonitis, which is why addressing them is an obvious ergonomic benefit. Concave Keywells - The keys are located within curved depressions which vary in depth for each finger and reduce and usually eliminate hand and finger extension. The non-neutral posture of extension occurs when the joints in the fingers curl up and extend forward from the hands rather than relaxing down slightly in the direction of the palms. A flat typing surface assumes that all fingers are of the same length, forcing the longer fingers to arch up over the keys, which inclines the hands up at the wrist. The positive incline of standard keyboards forces the hands to incline upwards at the wrist, resulting in further wrist extension. The result is wrist (and finger) extension which adversely impacts and can result in inflammation in muscles and tendons. The fingers then are prevented from operating at maximum efficiency and this will generally lead to more rapid fatigue, discomfort and pain. Concave keywells reduce extension by accommodating the various lengths of fingers and placing the hands and fingers in a more relaxed and neutral position. 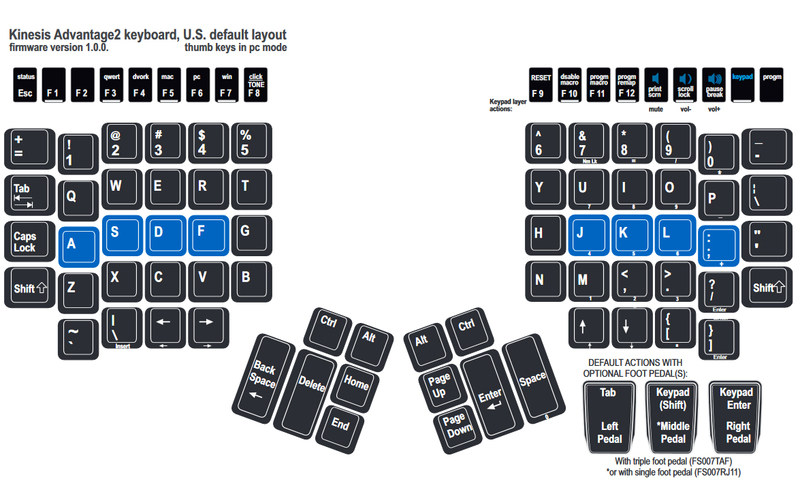 3-Dimensional Layout - Keys on a conventional keyboard are arranged on a flat 2-dimensional surface, resulting in the same piston-like firing action by each finger every time a key is actuated. The only variance is the position of the hand over the keyboard; the muscle action and orientation of the fingers is unchanged regardless of the key being targeted. The 3-dimensional layout of this keyboard encourages distinct key travel movement (i.e. angle and orientation) for the finger when pressing each key. 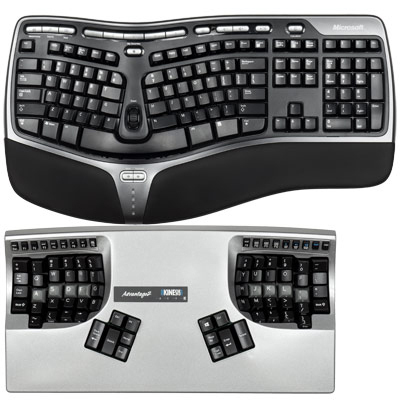 Consequently, different muscles and tendon sheaths in the fingers are used with every keystroke. Instead of a repetitive action which soon fatigues muscles and leads to strain, the fingers get a mini-calisthenic workout which increases blood flow and eliminates actual repetitive actions. Vertical Key Layout - Keys are arranged orthogonally in vertical columns to reflect natural motions of the fingers and reduce the reach between keys. Traditional keyboards use rows offset from each other which result in unequal finger travel and unnecessary hand and wrist movement. 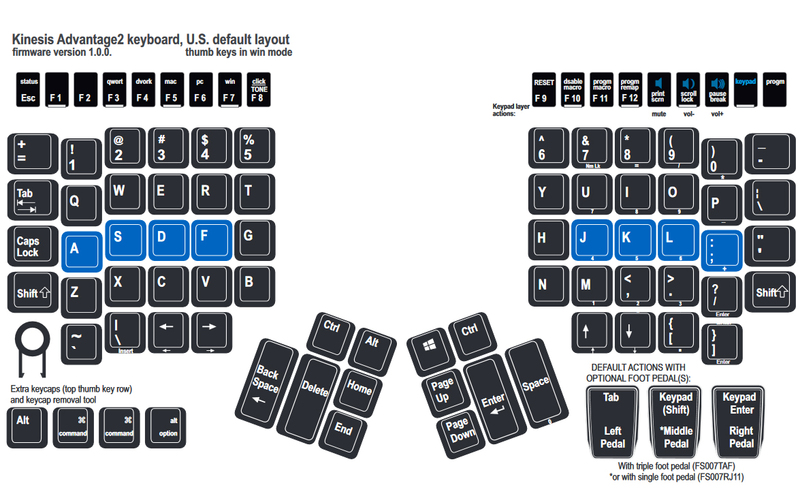 This orthogonal matrix layout increases typing accuracy and decreases the wrist distortion. The embedded numeric keypad is in a familiar grid pattern and benefits from the same 3-dimensional concave design noted above. Closer Placement of Function Keys - High performance Cherry ML tactile mechanical keyswitches are used for function keys which are located closer to the alphanumeric keys to reduce awkward motions and reach, particularly for key combinations involving thumb keys (Control and Alt, for example). 20° Lateral Tilt Design - This design orients the user's hands in a "thumbs up" posture such that the hands are at an approximately 20° angle with thumbs higher than pinky fingers. This design helps to minimize stresses associated with pronation and static muscle tension while enabling maximum keying productivity. Integrated Palm Support - The built-in palm support with optional self-adhesive Lycra pads enhances comfort and prevents wrist extension. This provides a place to rest your palms during periods of inactivity on the keyboard. Low-Force, Tactile Mechanical Keyswitches - The low-force (45 grams) tactile mechanical keyswitches are engineered to provide both tactile and audible feedback. They are full travel (4.1 mm) and activate at approximately 2 mm, which allows the user to reduce the likelihood of experiencing regular jarring impacts when "bottoming out" at the end of every keystroke. The final 2 mm of key travel can be used as a braking area for the fingers. The peak force (55 grams) prior to activation provides a subtle tactile indication of the fire point, providing users a clear indication of how much force and travel is required to generate keystrokes. Low-Force, Linear Mechanical Keyswitches - The low-force (45 grams) linear mechanical keyswitches are engineered to provide no tactile or audible feedback. They are full travel (4.1 mm) and activate at approximately 2 mm, however unlike the standard model which offers a slight increase in force to provide tactility, the force curve on the special order LF model of the keyboard is linear. Some individuals prefer to sacrifice tactility in order to have a silent, non-tactile keyboard although evidence has shown that without tactility, the amount of effort exerted when typing is higher due to a lack of feedback and the difficulty in creating "muscle memory". For a comparison of the above two mechanical keyswitch types, see our Comparison Table. Embedded 10-Key Layout - A traditional numeric (10-key) keypad is embedded into the right alphanumeric keywell, which provides ergonomic advantages for number-intensive operations. 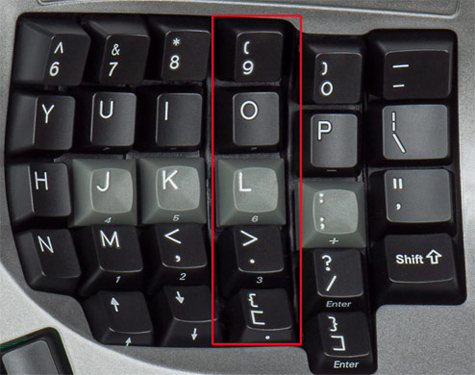 The 10-key legends are located at the top of the front facing edge of the key caps. The 10-key can also be manually programmed to operate from the left keywell. Key Re-Mapping - Individual keys can be re-mapped or copied to other key locations. As a result, the user can create their own custom layout to optimize the keyboard for specific work patterns, applications and keying frequency. Macro Programmable - Up to 100 macros of 200 characters each can be programmed and stored in the on-board memory of the keyboard. Macros are ideal for eliminating awkward key combinations or for minimizing the repetitive action associated with typing the same word or phrase repeatedly. Optional Foot Pedals - Up to three foot pedals can be used to perform keystrokes, redistributing a portion of the workload away from the hands. 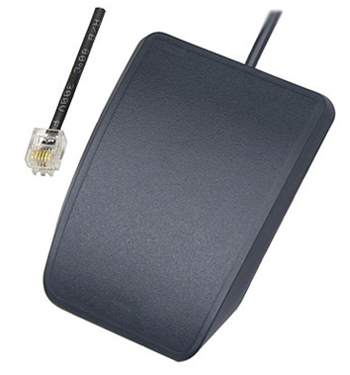 For instance, a foot pedal can be used to activate the embedded 10-key pad or "Shift" key. Smaller Footprint - This keyboard is smaller than a traditional keyboard, and is 16.625" Wide x 8.125" Deep x 3" High. This smaller footprint reduces the reach for the mouse by allowing the pointing device to be located much closer to the user. While on traditional keyboards the reach from the right hand home row to the mouse is on average 12", with the Contoured it is reduced to an average of 5". Research Study on the Contoured Keyboard Line. Remap: Any or all keys and custom key combinations, including the embedded layers (numeric keypad and multimedia). Macros: 100 macros of 200 characters each can be configured. Hardwired QWERTY/DVORAK Toggle: Instantly switch between QWERTY and DVORAK layouts. View and Edit Layouts: All custom layouts are stored as basic text files (i.e. .txt extension) in the non-volatile memory on the Advantage2. Status Report: Get a complete report on all current keyboard settings, remaps, etc. at any time. Modifier Keys Can Be "Sticky": If required, make multi-key combinations involving CTRL, ALT and SHIFT easier with sticky keys. Audible Clicks and Tones: The user can toggle on and off audible key clicks (for all keys) and audible tones (for change-of-state keys such as Caps Lock, Num Lock, Keypad, Scoll Lock and Insert). Adjust Macro Playback Speed: Playback of macros can be adjusted globally or on a macro-by-macro basis from 4.2 characters per second (CPS) to 250 CPS in 9 increments. 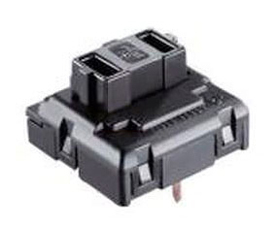 Supports Foot Pedal Accessories: The keyboard includes a RJ11 connector which permits you to connect a "dumb" single, dual or triple action foot pedal and map any desired high-frequency keyboard action (including toggling on the numeric keypad) to any of the foot pedal switches. Models supported include the Single (FS007-RJ11) and Triple (FS007-TAF) foot pedal accessories. Dual Legended Models: Looking for dual legends? Buy a "QD" Qwerty-Dvorak dual-legended model or if you want to upgrade later, buy a keycap upgrade kit. Dvorak-only legends are not available. Embedded Keypad: The embedded keypad offers maximum productivity and comfort for 10-key users, especially using a foot pedal. Cupped Home Row Keys: The home row keys are cupped with a special sculpting to aid in finger locating and positioning. 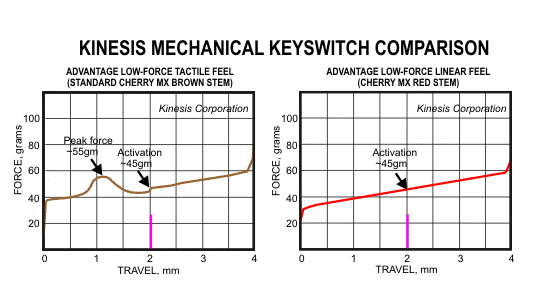 Keyswitch Type: Cherry MX Low-Force Tactile Mechanical Switch (Brown Stem) or Cherry MX Low-Force Linear Mechanical Switch (Red Stem). 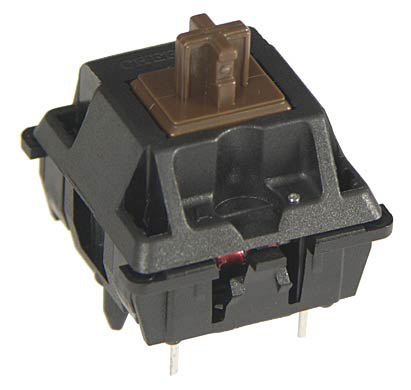 Function Row Keyswitch Type: Cherry ML Low-Force Tactile Mechanical Switch. Peak Force: Tactile - 55 grams (1.94 oz) or Linear - 45 grams (1.59 oz). Function Row – 50 grams (1.76 oz). Second default foot pedal action is "Shift"
Compatibility: Instant configuration for Mac, PC and Non-Windows PC environments, including Mac and Windows Legended keycaps. No drivers required, only requirement is one free USB port, one combination keystroke instantly reconfigures the keyboard. Mac - Supports Mac OS 8.6 and higher. Interface: USB only (will not work with a USB to PS/2 adapter). Embedded Numeric Keypad: The embedded keypad offers maximum productivity and comfort for 10-key users, especially using a foot pedal. Windows Keys: The Windows keys are easily accessed by pressing the embedded function key assigned to them.